We recover only half of construction waste, while the need for natural mineral resources is growing. 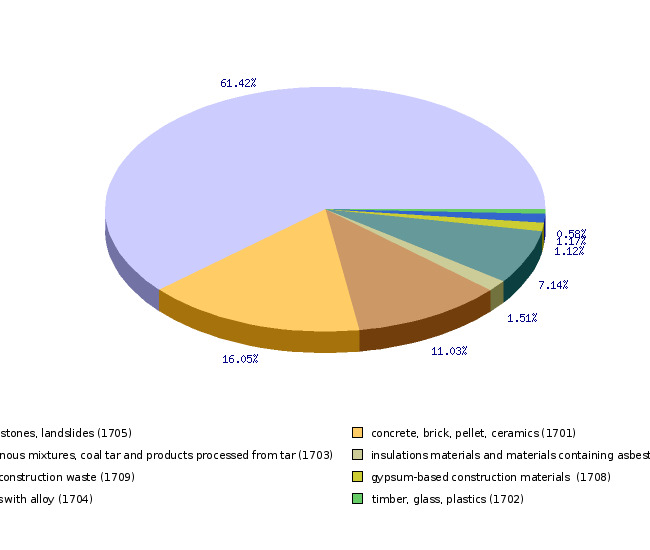 The indicator shows annual quantities of construction waste, its management and structure in 2005. Construction wastes are a mixture of materials resulting from construction work. Their management is defined in the Rules on the management of construction waste (Official Gazette of the Republic of Slovenia, nos. 3/03, 41/04 – EPA-1, 50/04 and 62/04 – amended). It stipulates obligatory management of waste resulting from construction works such as construction, reconstruction, alteration, renovation or removal of a building; i.e. waste belonging to the group of waste under classification number 17 on the classification list of waste materials. The provisions of these rules do not apply for excavation if it is carried out according to the Decree on burdening of soil with waste spreading. For all kinds of treatment of construction wastes that are not specifically governed by these Rules, the regulations on waste management apply. The treatment of construction wastes containing asbestos is defined in the Rules on the conditions for the disposal of materials containing asbestos in the demolition, reconstruction or maintenance of buildings and in the maintenance and decommissioning of plants (Official Gazette of the Republic of Slovenia, nos. 72/01 and 41/04 – ZVO-1). • To establish and operate an effective system of construction waste management (by 2008) which includes: separate collection at the site, 30% reuse, 40% recovering, incineration or use of wood in construction waste as fuel, 10% discarding as useless waste. For excavation waste – 30% reuse, 50% use of remains from processing, and discarding as useless waste up to 20%. • To register objects and plants that contain more than 1,000 kg of materials containing loosely bound asbestos and ensure the depositing of waste containing firmly bound asbestos to landfills for non-hazardous waste. The volume of construction waste materials is increasing. 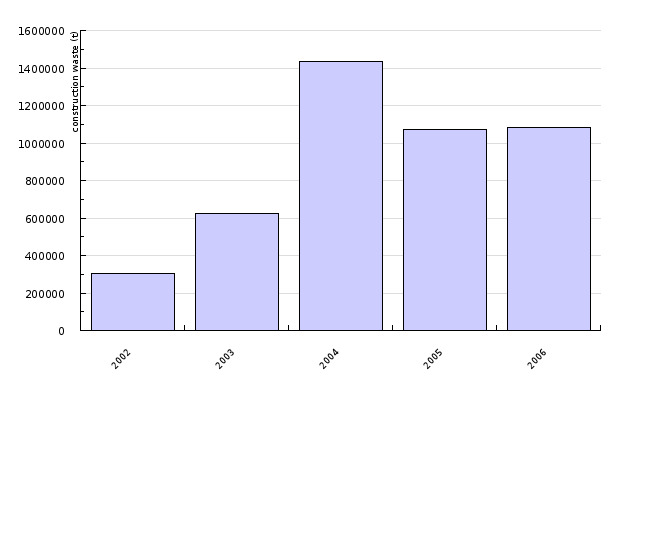 Between 2002 and 2005, the volume increased more than three times, which is a result of improved reporting and increased construction of different objects and road infrastructure. In 2005, Slovenia produced 1,072,052 tonnes of construction waste. In other European countries, the quantities vary due to the differences in definitions. According to Eurostat, a little less than 4 million tonnes of construction waste was produced in Denmark in 2003, and in Poland slightly more than 0.1 million tonnes. According to experts, the actual quantity of construction waste in Slovenia and other European countries is larger than that shown by official statistics. The problem of construction waste is not so much in the quantity of produced waste materials as in their treatment. 90-95% of these wastes can be recycled. In Slovenia, less than half of these wastes are processed, and the rest ends up at landfills for non-hazardous waste or as filling material for various depressions on the soil surface. In 2005, we processed 420,271 tonnes of construction wastes that are a potential secondary construction material, which reduced the need for natural resources. The largest percentage of construction waste are mineral components (more than 60%), and the need for mineral construction materials in Slovenia is, according to the Geological Survey of Slovenia, around 20 million tonnes per year. Reports on construction wastes containing asbestos (asbestos cement waste) were quite scarce. Probably, a large quantity of these wastes is hidden within mixed construction wastes, because until 2003, this type of waste was categorised as non-hazardous waste. By changing the categorisation of this type of waste as hazardous and informing the public and the contractors that asbestos is a hazardous substance, the quantity of these wastes has increased significantly in reports. According to the records available to the Environmental Agency of Slovenia, around 140 tonnes of such waste materials were recorded in 2001, and in 2002, the number rose to over 3,800 tonnes. In the past, asbestos was mostly used in the production of asbestos-cement products. Data indicate that approximately one quarter of individual buildings in Slovenia are still covered by asbestos-cement coverings, especially in the Podravje Region, where 30% of individual buildings are still covered with asbestos-cement coverings. The length of the built-in asbestos-cement pipes in Slovenia differs according to regions; on average, around 200 km of these pipes per administrative unit are still built-in. Some of the products containing asbestos are permanently built into buildings: splashed plaster, insulation, glues or insulation coatings. There is no information on the number of installations where more than 1,000 kg of materials containing loosely bound asbestos are built in, although the managers or owners of these buildings are legally bound to report such installations. Considering the quantity of asbestos-cement products placed on the market within the period of 15 years, i.e. 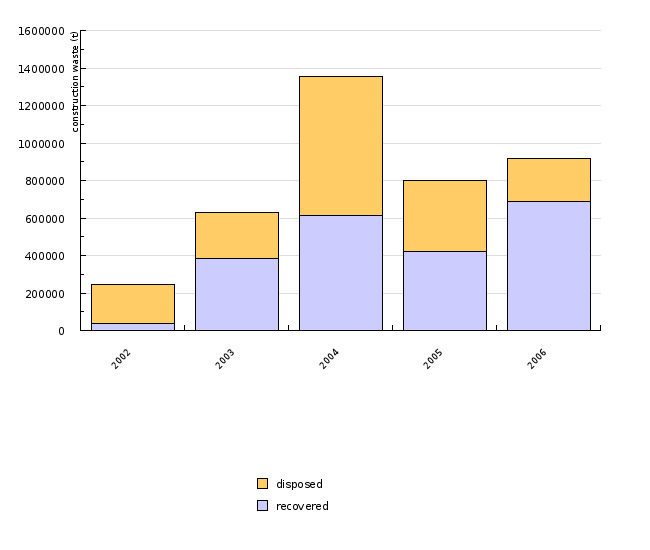 from the beginning of the 1980s (1982) until 1997, amounting to approximately 530,000 tonnes, and assuming that around 40% of these quantities have been taken care of so far, a rough estimate is that in the following years we can expect another 320,000 tonnes of these waste materials in Slovenia.